What is gasification and the syngas it produces? GASIFICATION is the process of breaking down carbon-based materials into a high-energy gas by applying extreme temperatures in an oxygen-starved environment. The gasification process significantly reduces harmful emissions compared to either incineration or landfills. The resulting product is Syngas – a flexible, local fuel source that is significantly cleaner than fossil fuels. Our system utilizes the syngas to fuel a generator, providing on-site clean heat and power. GASIFICATION PROCESS Organic Municipal Solid Waste (MSW) requires the initial step of recycling and sorting, then it is treated much the same as industry, agricultural, and forestry waste. Refined and processed into briquettes, the fuel stock is then fed to the gasifier system and converted into a high grade “syngas.” The syngas goes through a filtering unit before it is ready to fuel the engine to produce carbon-neutral heat and power. How is Gasification carbon neutral? GASIFICATION IS CARBON NEUTRAL Gasification is a carbon neutral process. 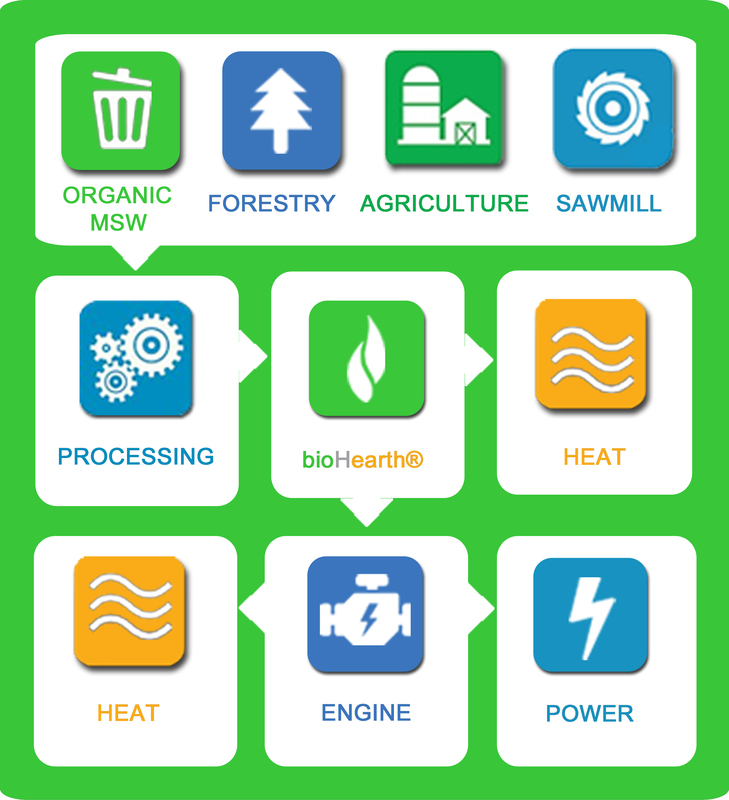 It fits in the carbon cycle in perfect harmony by using responsibly sourced biomass as fuel. 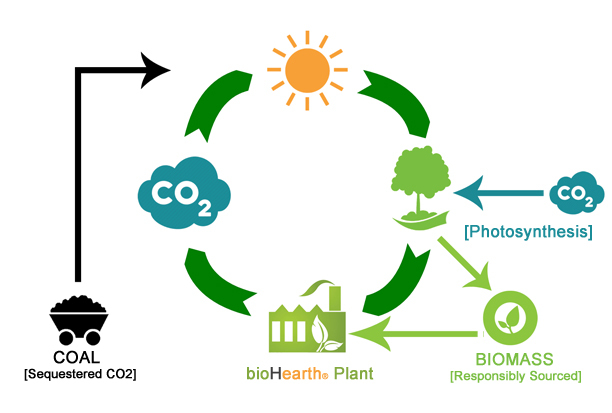 The carbon dioxide released from the bioHearth® gasification system is re-absorbed by plant life through photosynthesis, creating a complete carbon cycle. Fossil fuels release sequestered CO2, adding to the total amount of CO2 found in the Earth’s atmosphere. GASIFICATION IS NOT INCINERATION EPA has officially ruled that gasification is a separate process from incineration. This chart proves that gasification releases no harmful compounds unlike incineration. Gasification makes incineration obsolete in efficiency and environmental safety.